Around 1776, certain important people in the English colonies made a discovery that would prove enormously useful for the next two hundred years. They found that by creating a nation, a symbol, a legal unity called the United States, they could take over land, profits, and political power from favorites of the British Empire. In the process, they could hold back a number of potential rebellions and create a consensus of popular support for the rule of a new, privileged leadership. Howard Zinn, A People’s History of the United States. This is not the history I learned last week as I walked with my family from the Boston Commons to the North Church along the “Freedom Trail” or while visiting the Minutemen Visitor Center on the road between Lexington and Concord. Instead I learned about the heroes of the American Revolution and the narrative of events that led up to and followed “the shot heard around the world.” As someone with limited training in American history, most of which focused on the history of slavery, my tendency is to dismiss this nationalistic historical narrative and perhaps side with Zinn’s perspective. It is clear enough that the fight for independence only achieved liberty for some people in the United States, while many other groups continued to struggle for the freedom for many years to come. However, as someone interested in promoting history to a wider audience, it was hard not to be deeply impressed with the sheer presence of history in the Boston region. Much of the city and the region is a public history site. There were a fascinating mix of people and organizations presenting the history of the revolution including official (National Parks), commercial (dozens of guides wearing three cornered hats) and grassroots (a man sharing free homemade binders with extra historical information about one of the main cemeteries along the Freedom Trail). More impressive than the infrastructure was the thousands of tourists wandering through the streets of Boston learning about an important historical event on a grey Saturday in October. I expect a lot of people left knowing far more about American history than when they arrived. Between the historical plaques, museums, significant buildings like the Old North Church, and graves of famous figures, you can learn a lot about the outbreak of the war and the standoff between Gage and Washington on the surrounding hills during the months that followed. The explanations of the causes were a bit more simplistic than I would like, but the textbook narrative on the struggle against taxation without representation is well presented in the Old State House museum. The singular focus on the battles between the British and rebelling colonists missed an opportunity to discuss the long history of Boston. I would have loved to learn more about the social, cultural and political histories during centuries before and after 1776. For example, I must have heard about Paul Revere’s ride at four or five different historical sites. It would have be possible to diversify things a little bit (abolition does get a little bit of attention in Faneuil Hall) . That said, the opportunity to learn history in the places where events happened provides a lot of opportunities not available when reading a book or website. The reconstructed sections of road between Concord and Lexington allow visitors to see and understand the first battle of the war. Reading between the lines provides some opportunities to get beyond the standard narrative and biographical histories. The landscape provides some clues to the major transformations of the urban environment over the past two centuries. 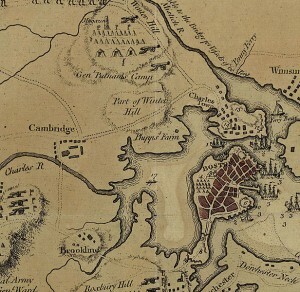 While environmental history is not front and centre, you do learn about the massive land reclaiming that took place as Boston expanded (making it difficult to imagine the Boston neck seen in the map above) and how the region between Boston and Concord has a lot more trees today than it did in 1775. Similarly, the different social standing of various memorable figures in the history provides some indication of how class worked in the late eighteenth century. Paul Revere was a craftsmen, while John Hancock was one of the wealthiest merchants in the city. Comparing their biographies gives visitors some insight into the social history of the revolution. All and all, I left Boston with a new interest in early American history and a desire to read more perspectives on these events. I hope the same is true for some of the thousands of other people who wander the “Freedom Trail” each day. I’ve also been to Boston and walked the Freedom Trail twice. It struck me as the sort of thing that I, an academic historian, was supposed to pshaw at (the literal line that brings you to key attractions). This was certainly the mainline rhetoric that I heard amongst many colleagues at York. But you’ve struck on what I felt: this is public history carried out extremely well. Maybe a wee bit simplistic, but not overly so. And throughout inculcating a spirit of historical engagement and curiosity. When I was there, the Faneuil Hall exhibits also seemed to do a great job of connecting historical scholarship with contemporary concerns.